Looking for a unique, high-powered box mod? 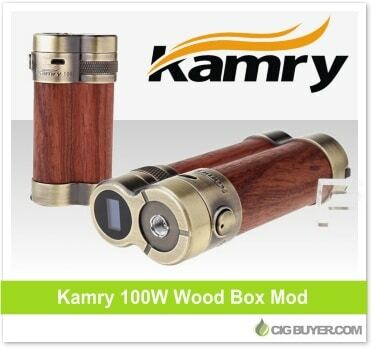 The Kamry 100 is an awesome looking device made out of rosewood and brass. It offers up to 100W of power, features a twist dial to adjust the wattage and a small OLED screen on top to display battery level, wattage, volts, resistance and puffs. It houses two 18650 batteries and operates in two modes – Normal (7-40W) or Super (7-100W). In super it can fire as low as 0.2 ohms… a neat-looking variable wattage mod packed with power!